If Far Cry 5 brought the series uneasily close to home with a realistic representation of rural America caught in the grasp of an extremist cult, then Far Cry New Dawn is here to drag the series back into the realm of comfortable silliness, dressed in a spiky crop top, with screwdrivers for fingers and a lit stick of dynamite tucked behind its half-bitten ear. Far Cry New Dawn, at its most basic, is very similar to Far Cry 5, and with less than a year between the games’ releases that was always going to be the case. But New Dawn strips out extras such as Far Cry Arcade – where you could build and play through user-generated levels – instead choosing to focus on the core pillars of Far Cry: meeting kooky characters, box-ticking exploration and resource gathering, all overlayed by explosive, high risk-reward combat. New Dawn is the first Far Cry to run as a canonical sequel to its predecessor, and 17 years after the “true” ending of Far Cry 5 we find Hope County in a much changed state. The landscape is familiar, but with a new, more varied colour palette that leans heavily on neon pinks and darker, overgrown greens, while the wildlife – from stripey buffalo to snow-white grizzly bears – wouldn’t look out of place at a Manchester rave. The set up is a familiar one. You play as an outsider who comes to the area with good intentions, only to wind up facing off against a charismatic and maniacal villain. This time around, you’re the unnamed head of security for Thomas Rush’s band of post-apocalyptic do-gooders, looking to help prepare Hope County survivors for life in the new world and guard against the threat of roaming gangs like The Highwaymen – led by twins Mickey and Lou. What I played quite closely followed the Far Cry blueprint: navigate the open world and all of its distractions to your objective, make your assault stealthily or all-guns-blazing, chat with someone and collect what you need, then make your – usually explosive or animal-aided – escape. The formula is refreshed somewhat though by the introduction of a better story progression system than Far Cry 5, and a few light RPG mechanics – no doubt inspired by their inclusion in Ubisoft’s other major franchise: Assassin’s Creed. Where in Far Cry 5 you’d be forced into a new story mission once you’d filled a meter that was constantly topped up by your actions, Far Cry New Dawn’s progression is tied to upgrading your home base, Prosperity, as well as completing quests. Upgrades require a new resource, ethanol, that you gather from the open world. It has the potential to become a bit a grind if you’re only interested in the story, but at least this time you have a bit more control over your own direction. Weapons, vehicles, and enemies are now grouped into tiers ranging from one to four that determine their power level, with higher ranked goons feeling significantly more powerful. It does a lot to more visibly change up the pace of outposts and missions, since you’re not just fighting the same three dudes over and over. To compensate for the stronger baddies, higher tiered guns feel a lot more powerful too. Your makeshift assault rifles start off firing more squirrelly than Rocky and Bullwinkle, but quickly become deadly as you boost their accuracy and add melee attachments. More Far Cry staples have been given the tiered makeover, too. Now once you’ve cleared an outpost, The Highwaymen will refortify it as a tougher challenge with higher ranked enemies. This goes some way to addressing the criticism that Far Cry 5 could start to feel quite safe and empty once you’d liberated large areas of the map. Or alternatively, makes slogging through samey activities take three times as long. The whole game is playable in co-op with friends, and the showpiece addition to New Dawn is definitely created with that in mind. Via a Canadian helicopter pilot who’s taken up residency at Prosperity, you can visit new locations all across post-nuclear America for self-contained Expeditions in unique settings like a beached Floridian aircraft carrier and a dilapidated theme park. These expeditions are a bit like the Spec Ops missions from old Call of Dutys, and like outposts can be replayed at higher difficulties as you get better equipment and more accustomed to New Dawn. The early ranks aren’t hard at all, but there’s easily enough variety in approach routes and strategies to support multiple playthroughs, especially in co-op. Expeditions are accessed directly from your mission journal, which make them perfect for short, focused blasts of fun that you can just jump straight into. 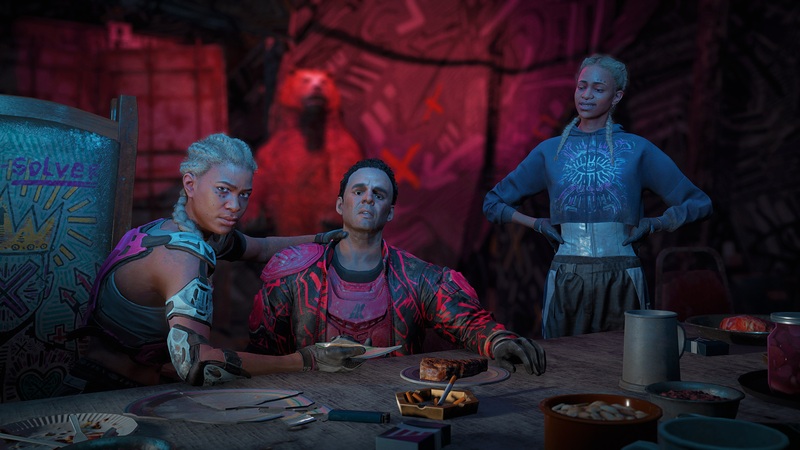 As a package, there’s not a whole lot that separates Far Cry New Dawn from its predecessor; but what it does offer is a more fantastical setting, a more replayable world, and a doubled-down focus on the gameplay fundamentals of the series. The post Far Cry New Dawn’s Expeditions let you visit new locations across post-nuclear America – hands-on impressions appeared first on VG247.